An operator removes the asphalt covering on the west end of the 20th Street bridge over I-676. Crews from Buckley & Company Inc. started working on the Pennsylvaniaa Department of Transportation's (PennDOT) four-year, $65 million project to rebuild seven bridges in Philadelphia last February. The project is on schedule to finish in late 2019 as the work progresses year-round. 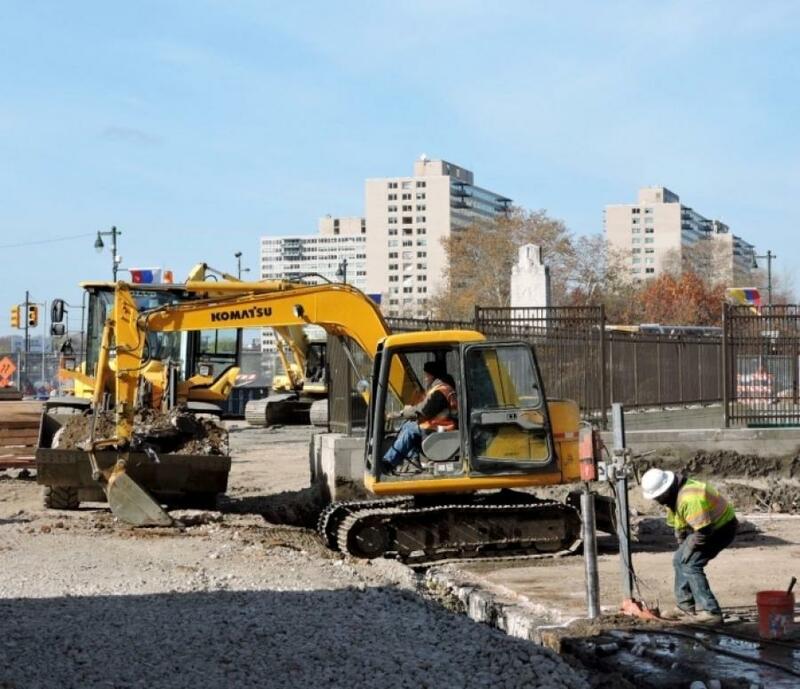 The project, funded by federal transportation funds, is replacing seven structurally deficient bridges — five owned by the city and two by the state — over I-676 (Vine Street Expressway) to enhance travel and safety on the highway and local streets. PennDOT held and attended more than 80 meetings with representatives from the city and the Parkway's cultural and residential community during the project's design stage. The first stage runs from February 2015 through June 2017, and will be completed in ten construction phases. This stage covers four bridges — the 20th Street/Benjamin Franklin Parkway bridge; the pedestrian bridge connecting Logan Circle and Vine Street at the Philadelphia Free Library; the 19th Street bridge; and the pedestrian bridge connecting Logan Circle and Vine Street at the former Family Court Building. Speed limits have been reduced on I-676 through the work zone, and some narrowing of lane widths has occurred. Screened fencing has been erected around each work area to protect pedestrians and create secure areas for construction personnel and equipment, and five statues/monuments within the work area have been enclosed in protective shelters and fencing during construction. Temporary closures of sections of sidewalks and some pedestrian crosswalks also are scheduled. 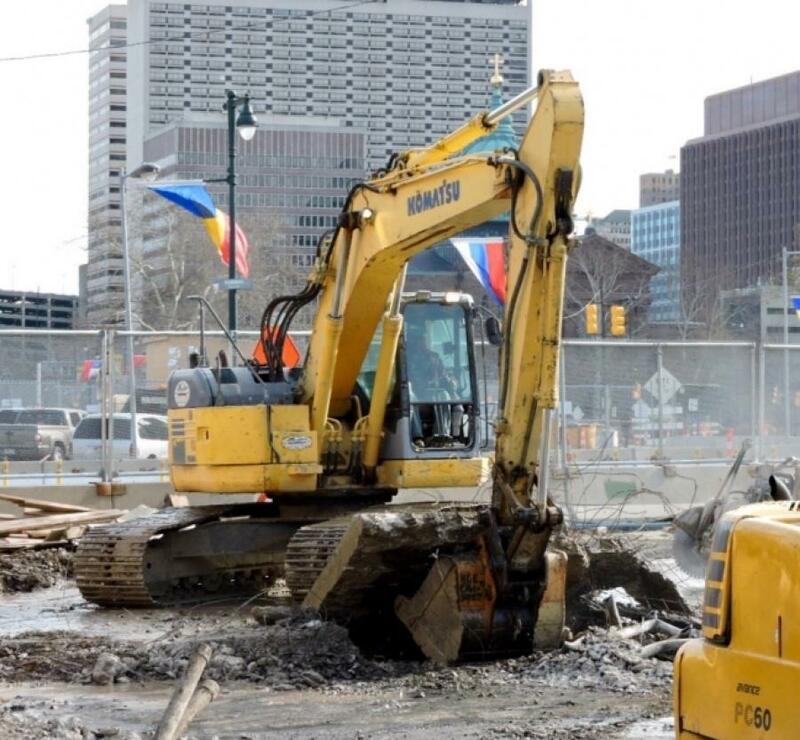 Each bridge will be closed to motorists and pedestrians during construction, except the bridges on 20th Street/Benjamin Franklin Parkway, 21st Street and 22nd Street. They will be rebuilt in stages under traffic. The 20th Street/Parkway bridge is being rebuilt in three phases to maintain four lanes (two in each direction) of traffic and pedestrian access in this area. 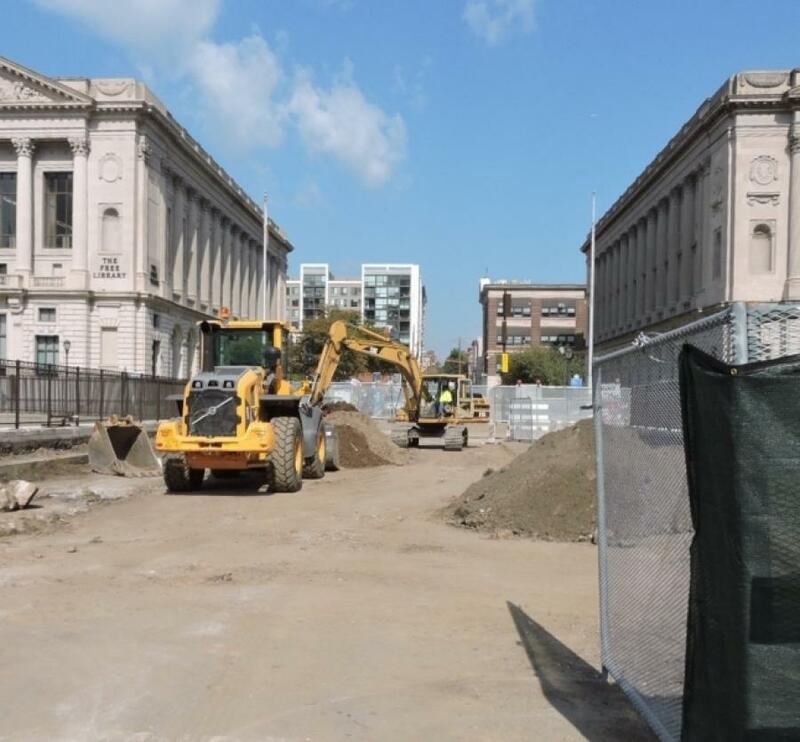 In addition to replacing the pedestrian bridge between Logan Circle and the Free Library, the existing public space (Shakespeare Park) is being refurbished and expanded to fully cover the opening that now exists on the west side of the park. The second stage of the project is expected to run from July 2017 through November 2019, covering the bridges at 18th Street, 21st Street, and 22nd Street. PennDOT's goal is to minimize disruptions on I-676, the Parkway and other affected areas during construction. The work during each stage of the project is being performed to maintain traffic flow and safe pedestrian movement. PennDOT recognizes the Parkway's role as a center for large public events and Stage 1 construction will be substantially finished in time for the city's planned Parkway Centennial Celebration beginning in 2017. As part of the planning for the Pope's visit to Philadelphia last September, work on Stage 1 was suspended for one month. PennDOT's project team includes Pennoni Associates - design consultants; Ammann & Whitney; LRSLA Studio; Chilton Engineering; American Geotechnical & Environmental Services; AECOM - program manager; Urban Engineers - Construction Manager; and JBC Associates for construction inspection. The stakeholders include a variety of educational institutions, churches and foundations that occupy historical buildings, as well as businesses and community groups. Currently, Buckley crews are preparing to set beams and begin deck construction on the new pedestrian bridge at the Free Library and a section of the 20th Street/Parkway bridge. With the superstructures of old Free Library pedestrian bridge, situated between 19th and 20th streets, and the eastern one-third of the 20th Street/Benjamin Franklin Parkway span removed, along with their center support piers, crews are modifying the existing abutment walls to carry the beams for the new bridges. 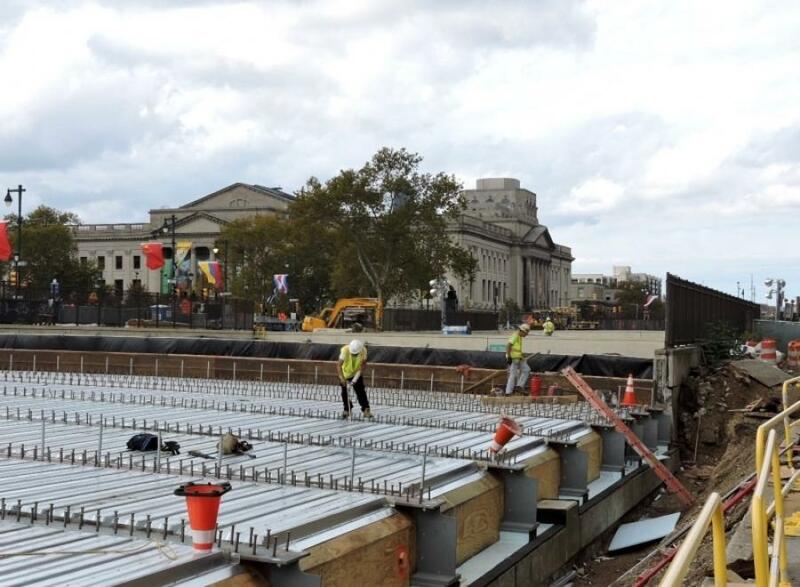 “Iron workers will then set the steel beams atop the modified abutments for the Free Library and 20th Street/Benjamin Franklin Parkway bridge and begin construction of the concrete decks for those structures,” stated the project Web page. “The deck for the 19th Street overpass, where some beams already have been set, also will be built in the coming months once the utility relocation work is complete and the remaining beams are in place. The concrete decks for the new bridges likely will be placed in early spring. The Shakespeare Memorial at the Free Library pedestrian bridge, the Pennypacker Monument at the pedestrian bridge between 18th and 19th streets, and the Civil War Sailors Memorial on the Parkway have been encased in a protective enclosure to prevent damage during construction. The Civil War Soldiers monument on the Parkway also will be enclosed this winter. The Miranda statue, situated along the Parkway near the Franklin Institute, will be relocated and enclosed this winter as well. All the protected monuments will be monitored during construction to ensure that damaging levels of vibration are avoided. The statues and monuments within the work area will be professionally cleaned. The project also includes investments to improve surface streets and public areas — the landscaping and hardscaping of public spaces at the two pedestrian bridges, along Winter Street and elsewhere within the work zone; new sidewalks; and shortened cross-walks at the sprawling intersection of 20th Street and the Parkway. There will be planting of trees and shrubs; new streetlights and traffic signal posts, sidewalks, granite curbing, and other urban infrastructure. Bill Fetters, Buckley's chief estimator, said the project was bid and awarded in December 2014, with notice to proceed in January 2015. Dave Warner, the firm's project manager, said that solid planning is giving their crews the edge in the replacement of the bridges and relocation of the utilities. The first step is to remove steel beams, abutment caps and superstructures. “We're putting in single-span, shallow, heavy-flange steel beams and relocating a lot of utilities,” he said. “We can only do so many bridges at a time to maintain pedestrian and vehicle traffic in the area. 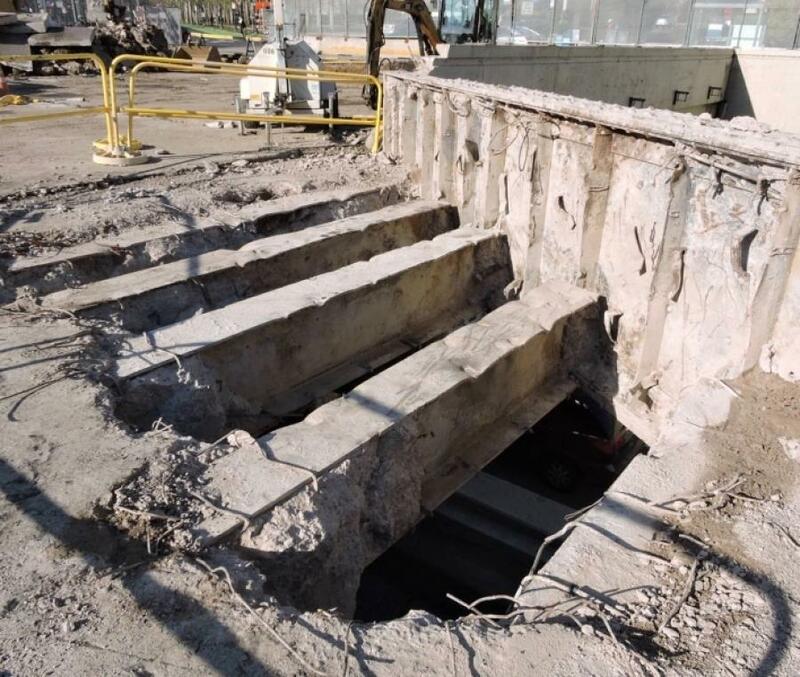 The utilities run through existing voids in the box beams, so you can only remove so much of the bridge and put part of the new bridge in and the utilities and wait for the utilities to relocate. Prior to reconstruction, crews are upgrading the substructure of the bridges via patching and epoxy, crack injection, and electrochemical-chloride extraction. Buckley assembles its own steel fence for the barriers, which is heavier than called for to protect construction workers, pedestrians, and motorists. 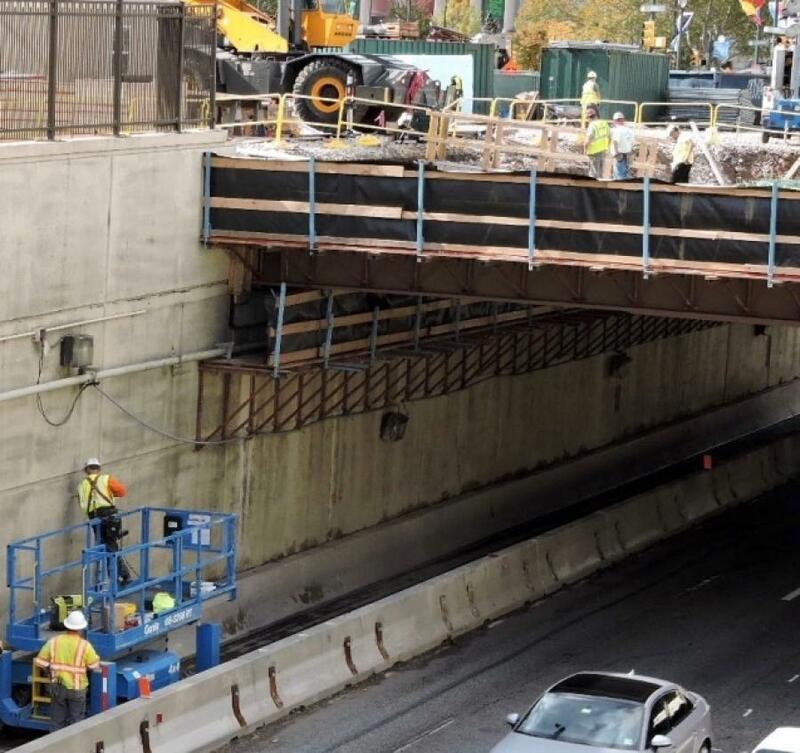 Night work is a playing a key role in the project and I-676 was closed almost every weeknight in both directions for the past eight months, which allowed for the removal of existing decks and replacement with newly fabricated steel beams. On a daily basis there are about 15 to 20 Buckley employees on site. As project progresses, subcontractors such as Kuharchik Electric; SJA Construction for asphalt paving; Structural Services for steel erection; and Atlantic Concrete Cutting will be brought in. Demolition consists of removal of more than 98,000-sq. ft. (9,104 sq m) of adjacent box beam superstructure, along with parapets, backwalls and abutment caps. All the precast beams are being taken to recycling facilities. Buckley expects to install 9,000 cu. yds. (6,880 cu m) of concrete, 700 tons (635 t) of rebar, 3,200 tons (2,903 t) of structural steel, and 30,000 tons (27,215 t) of aggregate and asphalt. For this project, Buckley is using PC 400 and Cat 225 excavators with hammers and buckets, a 140-ton (127 t) P&H truck crane and a Link-Belt truck for beam removal and erection, and hydraulic cranes — a 60-ton (54 t) Link-Belt and 75-ton (68 t) Grove. Also on site are various size loaders, dozers and boom trucks as required by the project. “We also modify equipment for specialized operations,” said Buckley. Bridge work has become a specialty for the company. Warner points out that safety is a prime concern.